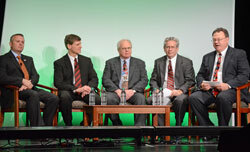 The second general session of the conference featured a panel discussion on diesel technology. Panelists included Glenn Ellis, Hino Trucks; Jim Michon, Ford Motor Company; Tom Fulks, Disel Technology Forum; Roger Gault, Truck and Engine Manufacturers Association and moderator Steve Howell, NBB Technical Director. Many OEMs have taken the road to B20, a major biodiesel victory. With increased fuel economy standards and ever-lower emissions requirements, do all roads lead to diesel? These automotive industry leaders discussed their leaps forward in meeting stringent fuel economy and greenhouse gas standards, and the new role they see for biodiesel. It was a lively conversation about the future of diesel vehicle technology.